Me: Can you tell us where you grew up and what was your introduction to fishing? TR: I started fishing off the beach in Western Australia with family friends on holidays. This continued as we had a small boat as I grew up, with some inshore fishing off the Gold Coast in Southern Queensland chasing mackerel and bottom fish. This led to getting to ride along on the local charter boats as mate with Mark Harris, Geoff Ferguson and Tom Black. Me: How did your love of marlin fishing begin? 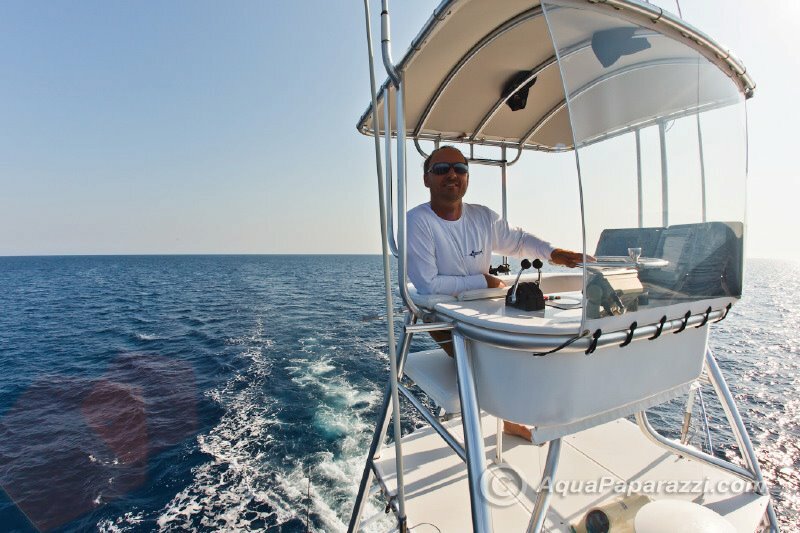 TR: I have been fishing full time since 1992, and was based in Stuart, Florida for close to 15 years, I fished the Bahamas Billfish Championship for many years as a mate, and also fished out of Montauk New York for a season. Since then I have fished in Bermuda, Carolinas, Florida, Bahamas, Turks and Caicos, Dominican Republic, Puerto Rico, St Thomas, all the way thru the Caribbean down to Grenada, Panama, and Costa Rica as well as the whole coast of Queensland and Fiji and New Caledonia. Me: Cairns in Australia, is the place in the world to catch black marlin, what is it that makes Cairns so special to black marlin fishing? TR: There is no where else like Cairns, this will be my 20th season, and my 10th running my boat the TRADITION, its the anticipation of what the next fish will be, it could be 300 lb, or the biggest fish you have ever seen !!! 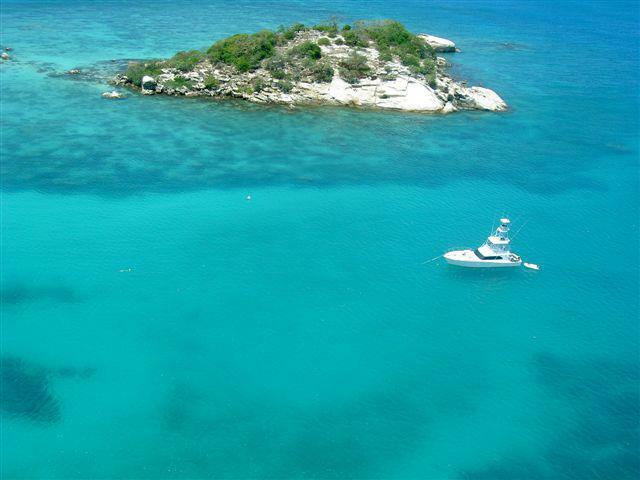 Snorkeling in the mornings, spearfishing, bottom fishing, poppers, jigging, it has it all, and staying out anchored behind the reef , less than a mile from the grounds make it so special. 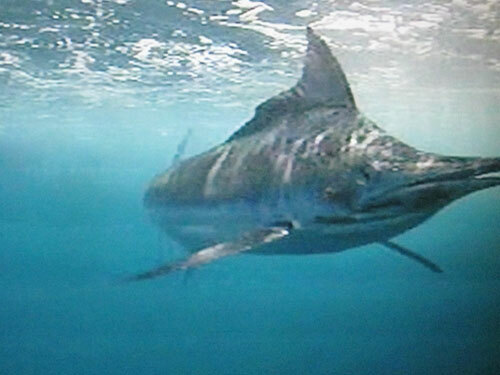 The black marlin come to the Great Barrier Reef from September to December each year to breed, and thats why there is a large aggregation of big fish, and the smaller males that are there to look after the big girls. Me: You also operate out of the Dominican republic, what is the fishing like there? TR: The DR is a great destination for anyone who loves to fish, its 2.5 hours from Miami, and also has direct flights from Europe many times a week. The fishing is a mix of FAD fishing for blue marlin pretty much year round out of Casa De Campo, (La Romana) Jan to April/May, and Cap Cana May to November. 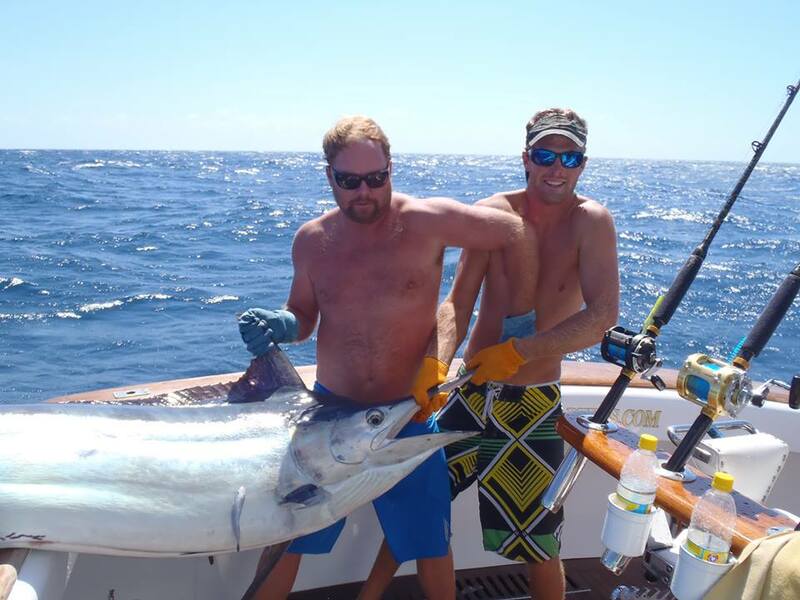 As well as a great white marlin bite April to July just a few miles off the beach at Cap Cana (Punta Cana), and then the blues show up out front, and then as the year goes on, July to November we fish the FADs north of Cap Cana. 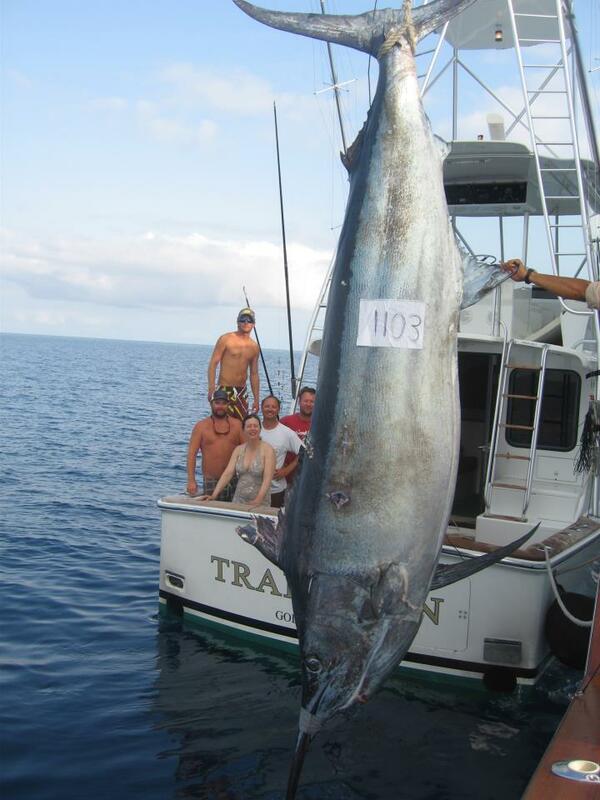 The large number soy fish make it a great place to teach people how to fish better an also for fly fishing for marlin due to the number and size of the blue marlin, where they are mostly 100- 400 lb. This last season we consistently saw 6-10 marlin a day. 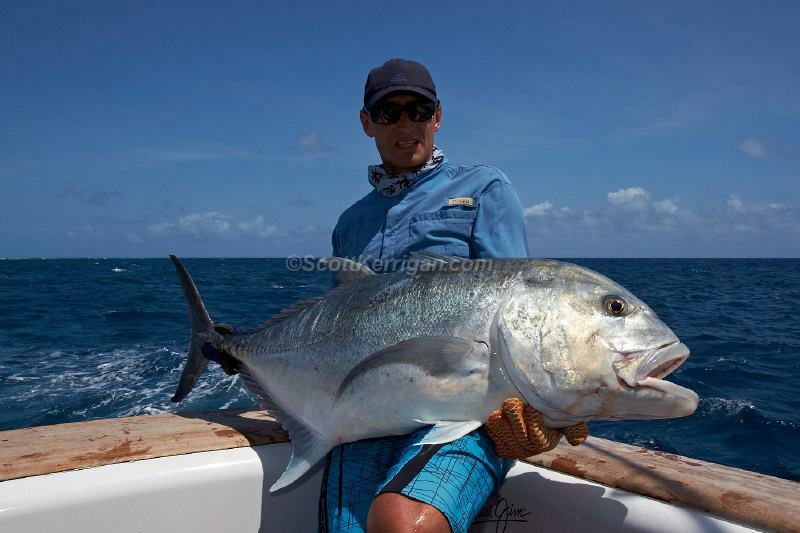 Me: Besides marlin, do you ever get much chance to fish for other species nowadays? TR: I pretty much only marlin fish, but of course on the GBR we throw poppers for GT’s, and fish for coral trout and spearfish as well. Between 6-7 months in the Dominican Republic and Caribbean, and then 3 months on the Great Barrier Reef, theres not much time for anything else between keeping the boats in top condition. Me: You have caught many marlin over the magical 1000lb mark, what have been your personal favourite highlights over the years? TR: I think the first one is always special, and as a mate my biggest fish weighed have been 1173 lb black, 1207 lb black and 1199 blue in Bermuda. 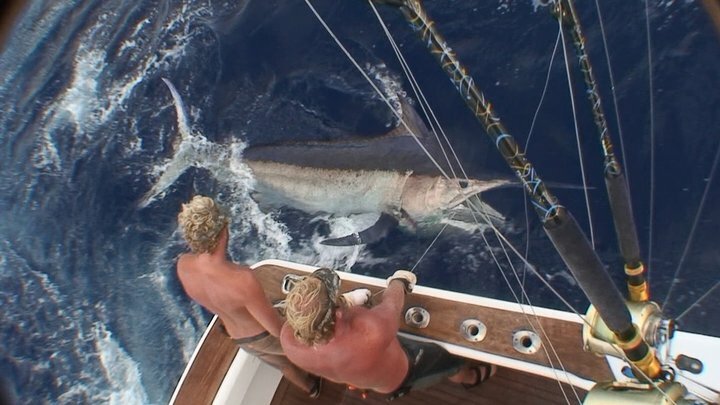 As a captain i have let a lot of big fish go, and the few we have weighed were very special fish, including Lydies’ 1103 , as well as my biggest fish at 1220 lb for Stetson. I have lost a few monsters, with Capt Greg Edwards and Bo Jenyns and I on deck we got the 1207 lb, and many more over 1000 lbs, but we lost 2 fish that were enormous, 2 years in a row with the same angler, just huge fish. Lydie fought a monster fish a few years ago, which took us 12 miles out to sea and 4.5 hours before we broke her off on the leader, a true giant fish, an that same year we had a bite from a monster that didn’t come tight. One time fishing with long term client Greg, we had a double, the big one fell off, the small one was about 950 !!! Me: Is there anywhere left in the world you would still like to try? TR: Well like anyone, who wouldn’t want to go see Cape Verde / Azores / Madiera !!! with our new boat in the Caribbean, we might end up there one year. I would still like to go see the giant tunas, but timing is hard for me, but Id love to go see them in Bimini/Cat Key if they make a resurgence. Me: If you could relive any one day you had out fishing what would it be? TR: Id love a shot at a couple of the monster fish we have had on again, with our better knowledge now and increased aggressiveness, we might get another shot at them!! I have had some incredible days, we caught a really big fish, about 1100+ for Dave Conkle who owns the “Miss Babbie”, that was an incredible fish, but the best one would be for my boat painter George, we had had a great week previously with Lydie, and then the boys came and we caught a few up to 900, but Georges fish was one of those special ones, we caught her in 12 minutes, huge jumps on the leader, peeling maximum drag like nothing, and then we had her just swimming next to the boat, her dorsal was huge and such a big well proportioned fish, and after we have weighed the 1220 a couple of years ago, Georges fish was just so much bigger. We tagged her and watched her swim off with the males in tow, I’d like to see her again !! Me: And finally what are your fishing hopes for the future? TR: I love growing my charter business and making my clients happy all over the world. We are doing more and more fly fishing for marlin which is a great challenge, and with 2 exceptional boats in 2 great locations, it can only get better!! 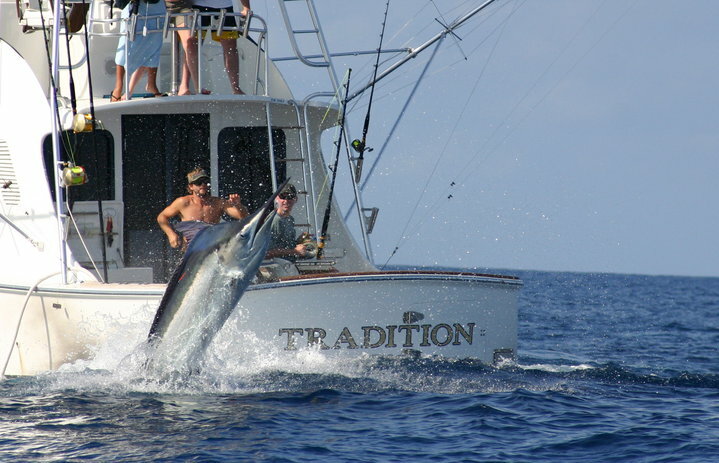 This entry was posted in Interviews, Travel and tagged Black marlin, Blue marlin, Cairns, Dominican Republic, Tim Richardson, Tradition charters. Bookmark the permalink.